The holidays are upon us and in the midst of carols, cookies, lights and gifts it can be easy to lose sight of the wonderful reason we celebrate this season. Jesus’ birth, foretold hundreds of years before his arrival, was the fulfillment of a promise spoken to the Jewish people who were awaiting freedom from an oppressive government. But the world got more than they ever hoped for. Jesus came, not to bring peace between people, but rather to bring a much more significant peace: peace between God and humanity. Follow this amazing story as it unfolds before your eyes. Jesus’ birth was no secret. As a nation eagerly awaited their savior, they looked for a conquering king. Little did they expect a child in a manger, born in obscurity to a teenage virgin. Though armies of angels announced his coming and the stars aligned to point the way, the only ones present to greet this child’s arrival were lowly shepherds, and wise men who had traveled from a distant land. Most people couldn’t believe that he would come like this. But through this child, the cries of a people for a savior were answered. This was God’s only son, Jesus. Immanuel. God with us. As with his birth, much of his life was lived in a similar way. Simple obscurity. He was a humble carpenter who loved people, and obeyed God. Moving quietly among his friends and neighbors, he lived up to the names by which he would one day be called—Wonderful Counselor, Mighty God, Prince of Peace. Jesus’ life was marked by love, forgiveness, compassion and miracles. He consistently loved the unlovely, comforted the brokenhearted and brought hope to the helpless. And his message was simple: Love God with all your heart, and love others as much as you love yourself. There was no condemnation through guilt, only liberation through grace. He didn’t come to judge but to save, as the Bible says so clearly, “because God loved the world so much”. This perfect life of Jesus produced the holiday blood. The son of God poured out his blood for you, so that you might experience true peace, true love, and true joy. 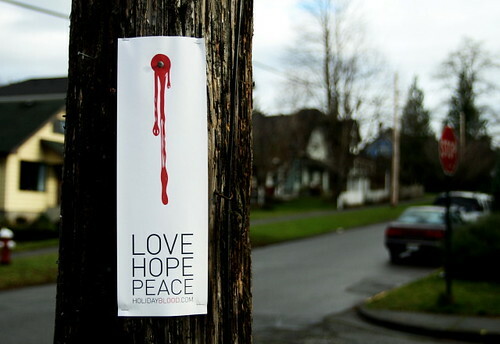 His blood offers forgiveness from guilt, and removal of shame and condemnation. This holiday season, experience the real reason Jesus was born—to offer you unconditional love and forgiveness. It’s the best gift you could ever receive. Not that I disagree with it in anyway, but wouldn’t that image be best used around Easter, when we celebrate Christs death and ressurection, than Christmas, when we celebrate his birth?